Follow us on Twitter @PovertyAlliance and use the hashtag #PovertyAssembly to join in the conversation. You can even ask questions direct to panel members for the debates happening at 11.30am on 15th March and 11.40am & 2.15pm on 16th March. Watch the main speakers and debates via our live video stream. Turn up in person. Tickets are all gone I’m afraid, hopefully some of you were lucky enough to grab one. Talk to our social reporters. We’ve got a great team of volunteers tooled up with audio recorders and handheld video cameras, ready to speak to attendees over the two days. All this content will get uploaded immediately and will be available after the event on our YouTube and SoundCloud channels. All of the above. 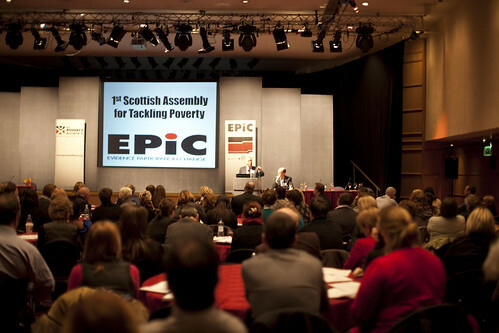 Whether you’re turning up in person or following the event on line we’d like everyone to get truly involved in the #PovertyAssembly 2012 – it’s your event.